TOP 10 PRIVATE SPACES OF 2016 | "Global Possibilities"
over the past 12 months, designboom has featured a wide range of architectural projects that offer their users a unique retreat from the outside world. despite being diverse in scale, material, and setting, our selected schemes all offer inventive solutions for small spaces that both that respond to, and engage with, their contexts. from a house with a transparent garage in japan, to a monolithic concrete dwelling in portugal, we continue our 2016 roundup with a look at residential dwellings and private spaces. 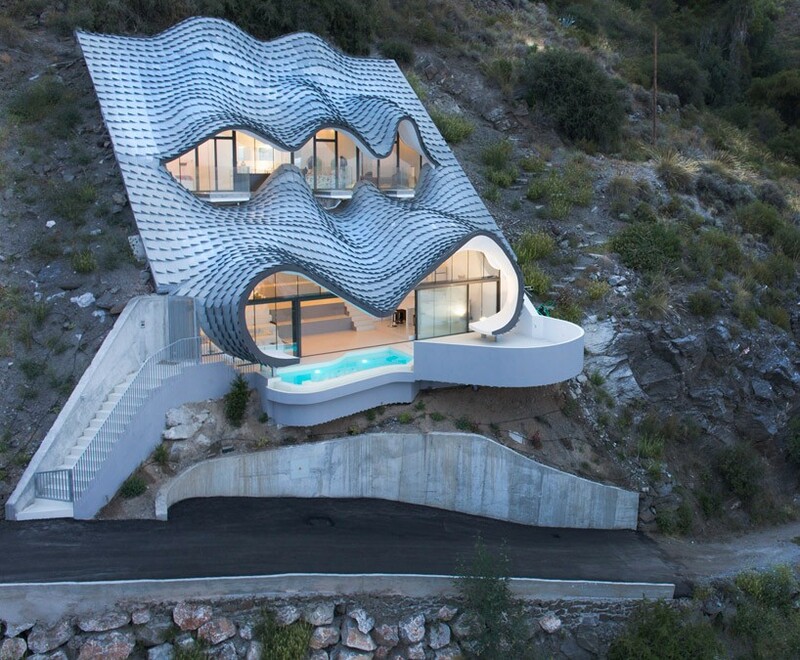 faced with a challenging site, gilbartolomé architects chose to embed the distinctive ‘casa del acantilado’ deep into a cliff overlooking the mediterranean sea. located in granada, spain, the complex scheme was the result of ambitious ideas from both the client and the architect. 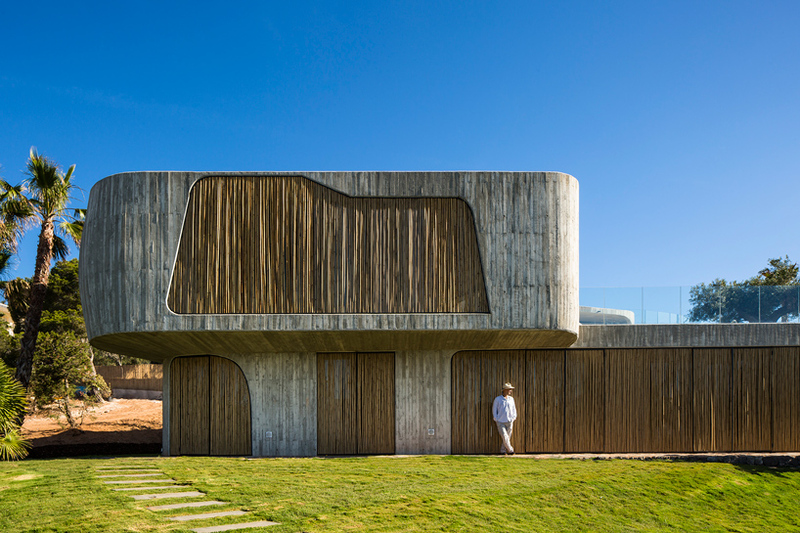 the brief called for a structure that would seamlessly integrate with the region’s landscape and contain interiors orientated towards the sea. 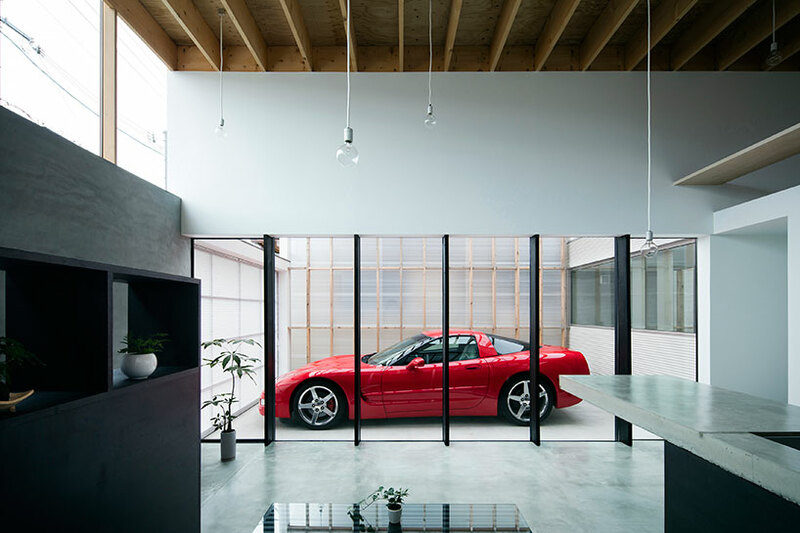 in kyoto, japanese architect yoshiaki yamashita completed a single-storey timber dwelling for a couple of car enthusiasts. the design places their vehicle at the center of the scheme, as part of a garage that can also serve as a sheltered terrace. a kitchen and dining area adjoin this primary living space, with a bedroom positioned at the other end of the home, linking to a private backyard. although the house measures only 173 square meters, double-height volumes and an abundance of natural light ensure that it feels much larger than its modest size. 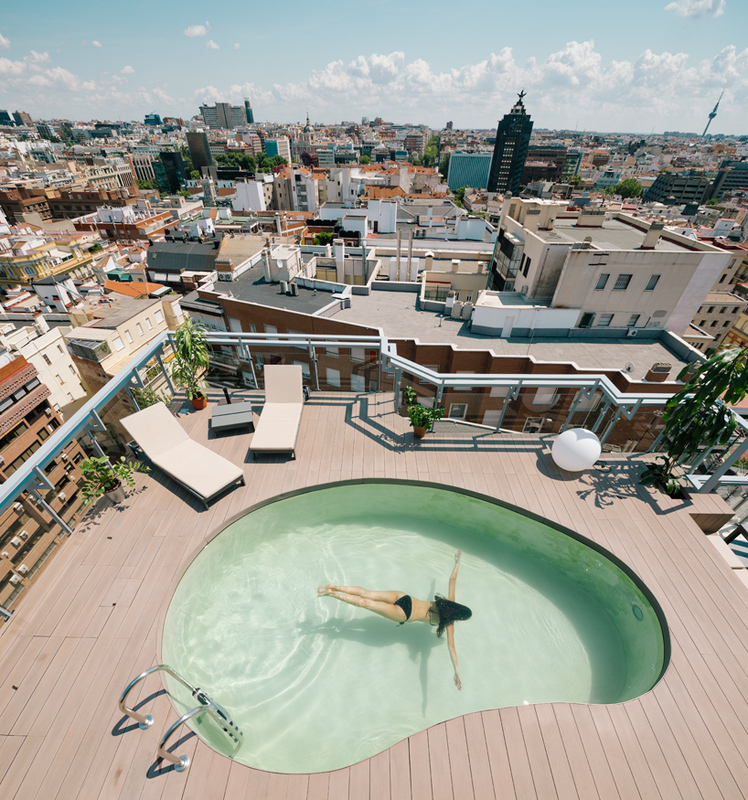 presented with a 360 degree view of madrid’s urban landscape, i! arquitectura renovated a top floor apartment in the heart of the city. named ‘a chalet in madrid’s sky’, the residence is spread between two levels, with one terrace featuring a swimming pool reminiscent of those found in american motels. the approach to the project was to bring the countryside into a city setting. norwegian studio lund hagem designed a cabin in norway that replaced two previously existing structures. 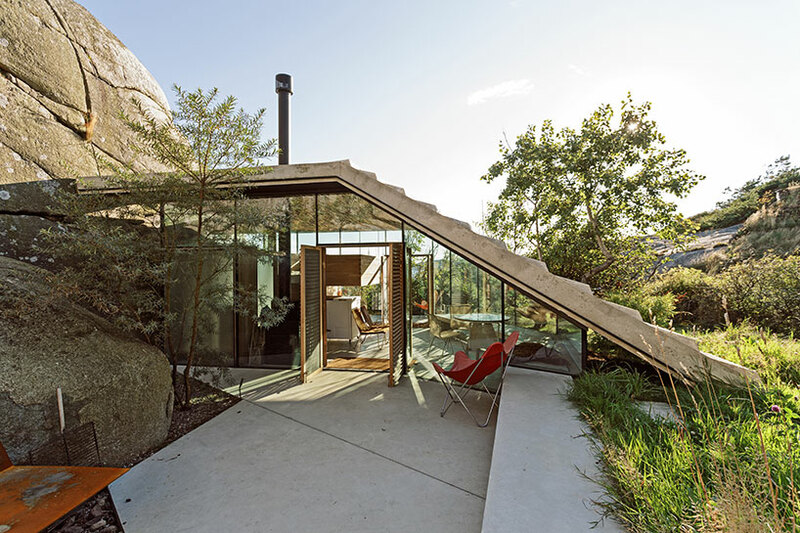 the building is accessible from a small path cutting through a heavily vegetated area from the main house, taking advantage of large boulders that form a naturally protected area. the scheme features a unique precast roof that extends from the side of the rock and angles down to meet the ground plane to double as a staircase leading to a rooftop deck. beneath the free-standing canopy two exterior storefront walls make the structure almost transparent across the landscape. the small footprint minimizes its impact on site, and instead enjoys three levels that contain a small living area, a suspended bed, and bathroom overlooking the sea. 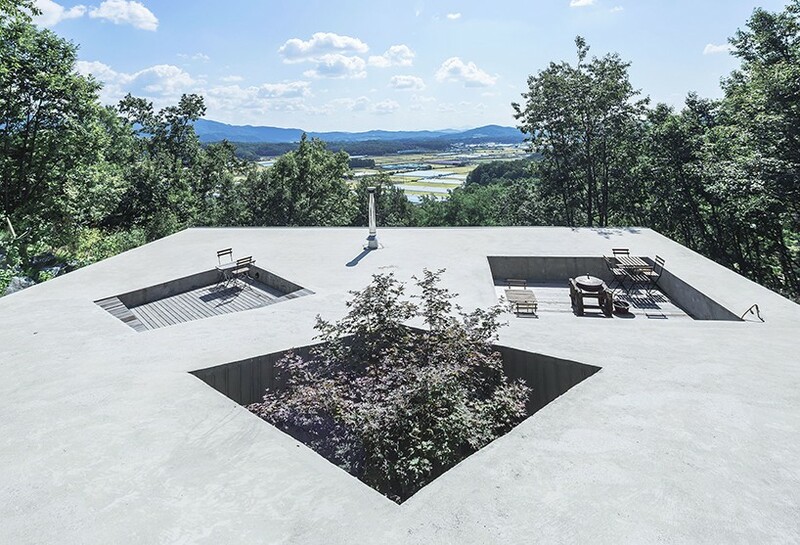 this reinforced concrete house has been embedded into a grassy slope amid the undisturbed mountains and rice fields just an hour east of seoul, south korea. designed by BCHO architects, ‘tilt roof house’ derives from the concept of ‘chi’, a traditional asian term meaning the universal energy that permeates and exists through everything. by taking advantage of the steep slope around the site, the house blends with the topography and minimizes the need for excavation. people’s architecture office (PAO) custom designed one of its ‘plugin’ houses for a resident of beijing’s central changchun jie neighborhood. the client, mrs. fan, was born and raised in the area and, rather than move out to the suburbs, wanted to continue living in the historic hutong community. in general, the price of real estate in central beijing makes owning a house nearly impossible. however, the plugin house costs 30 times less than a typical apartment. 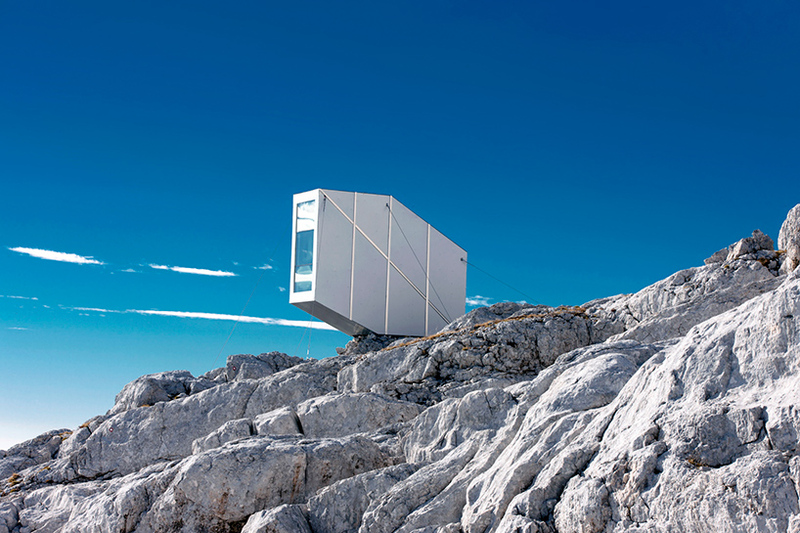 OFIS architects shared its design of a winter cabin constructed on top of mount kanin in slovenia. the compact dwelling has the capacity to accommodate nine mountaineers, providing shelter from the region’s harsh and extreme weather conditions. OFIS worked closely with various structural engineers to develop the self-contained wooden shell with a cantilevered form. the site itself is accessible only by climbing or helicopter, meaning that the modules and loads are prepared according to the maximum weight and equilibrium limits. 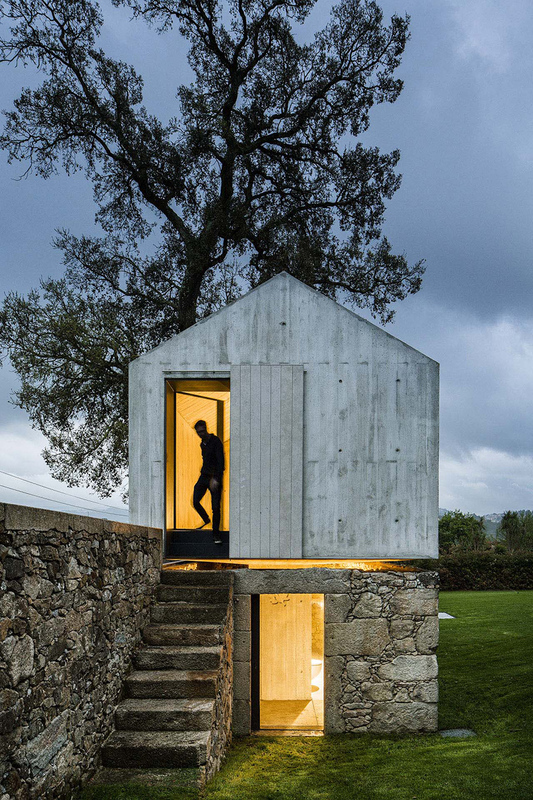 AZO sequeira arquitectos associados reinterpreted a former dovecote to house a completely new program. located near the northern portuguese city of braga, the project has been conceived as a ‘minimal concrete treehouse’, influenced by a spirit of childlike fantasy. the scheme comprises a gabled concrete volume that appears to float above the site’s existing stone walls. the new structure contains a child’s playhouse at its upper level with a bathing room below, serving the adjacent pool. italian architecture studio metroarea constructed a multi-storey residence on the spanish island of ibiza. 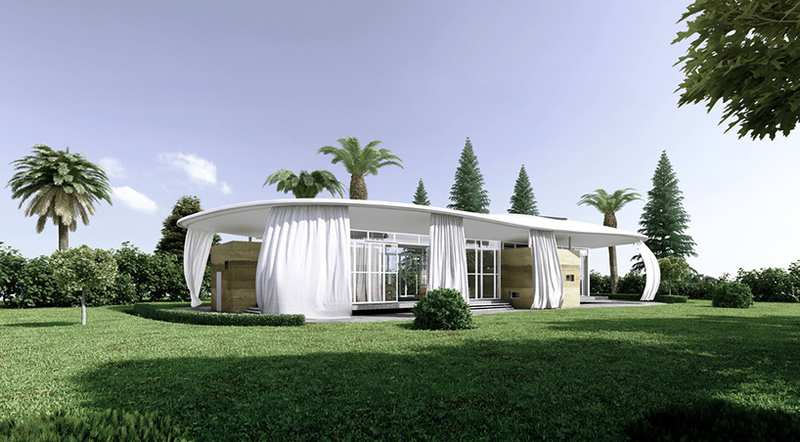 the design of the remote dwelling is inspired by the mediterranean’s vernacular architecture, taking its cues from roman villas, as well as the expressionist works of italian architects luigi moretti and giovanni michelucci. ‘for us, designing a contemporary building in 2016 means establishing a dedicated dialogue with history and with nature,’ explained the design team. conceived for a rural landscape populated with olive trees, the ‘residence-atelier-foundation’ is oriented to face the majestic white outline of morocco’s atlas mountains. designed by philippe barriere, the scheme comprises a private dwelling for the client, a pavilion for her three children and guest artists, and her personal atelier. in addition, the complex can also host art exhibitions as well as a foundation dedicated to the work of female moroccan artists.